We provide complete, regularly updated Mortgage Lending, Correspondent and Broker Policies and Procedures Manuals and Mortgage Quality Control Plans to help you comply with Federal Laws and Agency (Fannie Mae/ Freddie Mac, FHA-HUD, Ginnie Mae) requirements. The complete packages exceed the CFPB's requirement for a Compliance Management System (CMS). Delivered instantly after ordering via e-mail, you can edit these in Word, Excel and PowerPoint today. We provide industry standard documentation for you to customize to match your company's practices. We provide regular updates - at no cost, no subscription required. 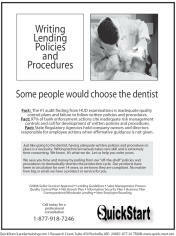 Writing and implementing policies and procedures represents one of the most time consuming and costly tasks facing compliance managers, operations executives or line business managers. Whether a quality control plan, business management system, policies, procedures manual, or training program, writing from scratch can be a painfully time-consuming process. Our mortgage policies and procedures manuals are not "fill in the blanks" PDF's. You you get Microsoft Office compatible and editable documents. In addition, unlike other content providers, we do not copyright or lock our content, so you can completely modify your product; delete, add, re-organize, publish electronically to your heart's content. Added Value - Each Module Contains MULTIPLE policies and procedures, not just one. 2/8/2018 - Compliance - Updated HMDA Reporting Process - Based on CFPB changes, expanded data collection and interpretations. 11/27/2017 - Compliance, Origination, Underwriting - Updated Pre-Qualification Policy and Procedure. This policy clarifies what a pre-qualification is, and under what circumstances you must report a denial.